Large Size Design: Measuring 700 * 300 * 2mm / 27.56 * 11.81 * 0.08\" you never have to worry about your mouse running off the edge of the pad and disrupting your game play at the most crucial moment. At the same time, it provides a larger usable area to cover keyboard, Mouse and stuff on the desktop when playing games. High-quality Material: The fine cloth cover delivers excellent glide characteristics that allow you to execute fast swipe and pull off high-precision shots with confidence and consistency. It lets your mouse slide smoothly and precisely along the pad. 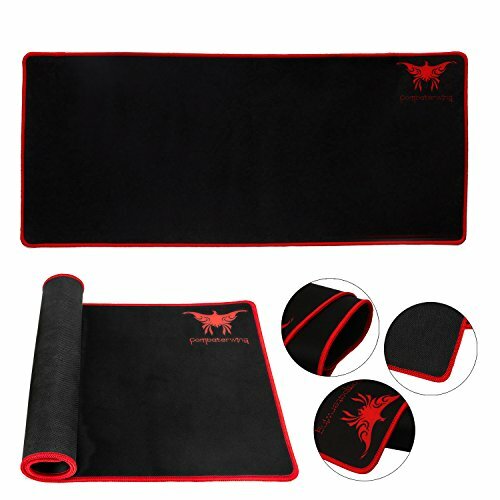 Water Resistant Surface & Non Slip Bottom: This mouse pad has a waterproof coating to prevent damage from spilled drinks or other accidents. Anti-slip rubber bottom prevents this mouse pad from sliding or movement. Never worry about it slides around or drift on your desktop while you\'re using it, even during the most intense gaming. Edge Covering Design: Edge covering design provides a long service time and prevents the top layer strip away from the base. Reinforced edges prevent deformation or damage. Anti-fray Stitched frame & Machine Washable: The edges are expertly reinforced by a tight stitching process that not only looks great but also prevents damage and deformation, greatly increases lifespan and aesthetics of mousepad. And it\'s machine washable to have no worries even with the toughest dirt or stain. Perfect addition for all gamers. Perfect size, stays flat and a brilliant grip. A hit for my gamer son! GOOD BIT OF KIT FOR A GAMER!